AffluenceIQ is the only Database profiling the highest net worth families in Massachusetts. Developed by a team of researchers in 2015-2016, AffluenceIQ represents the culmination of an unprecedented effort to unveil the lifestyles, net worths, and influence of Massachusetts' wealthiest VIPs. The AffluenceIQ team has a background researching Venture Capital and Private Equity Data, as well as broader Financial Services information. The team relied on an advisory group that included Hedge Fund Managers, Accountants, Venture Capitalists, Information Technology professionals, and Journalists fluent in Massachusetts business. With your one-year subscription, you'll have unlimited access to more than 2,000 profiles of individuals with a net worth of $10 million or more. Please call us at 877-424-6695 if you have any questions about the product. A range of Non-Profits can target future donors. Colleges and Universities will discover wealthy alumni. Purveyors of Real Estate, Yachts, Private Jets and other luxury goods and services, will find ideal prospects. 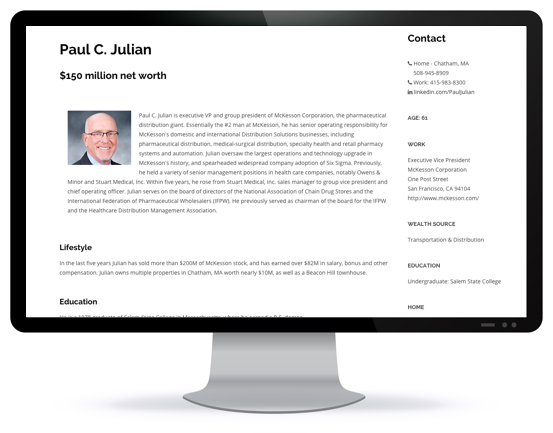 AffluenceIQ is the only Database profiling the highest net worth families in Massachusetts. With your one-year subscription, you'll have unlimited access to more than 2,000 profiles of individuals with a net worth of $10 million or more.